“On Plane View” is the title of a new exhibition in New York showcasing the photographs of artists Max de Esteban and Doug Fogelson. Whilst the artists are individually concerned with different narratives, the aesthetics of their work meet via a shared visual concept, that is concerned with a reduction of three-dimensional objects into flattened graphic shapes and the dispensing of linear perspective inherent in Western art. to the natural world, or with outmoded technology such as vinyl records and architectural forms. The exhibition includes 7 unique silver gelatin photograms and 6 color, limited edition prints made from color transparency photograms. 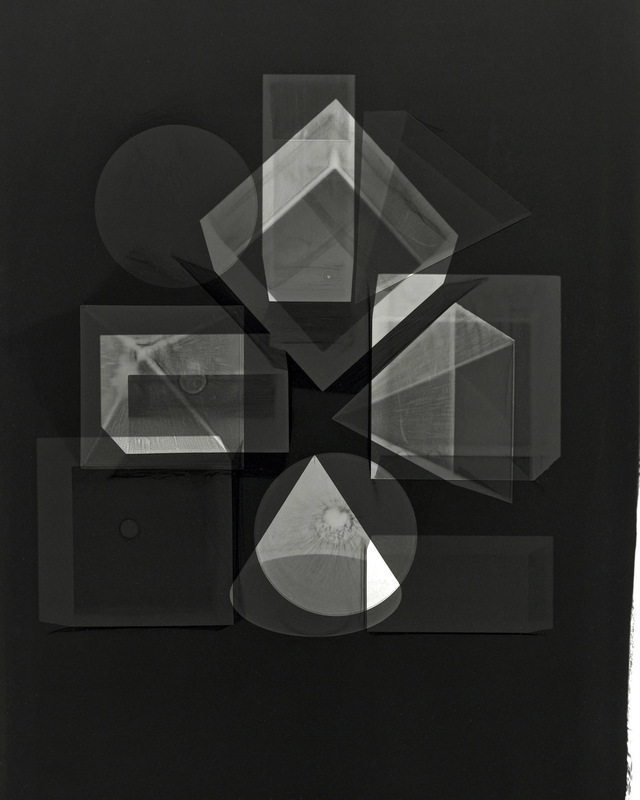 The photograms are created through a series of carefully considered multiple exposures, with the color work incorporating additive color mixing, and blending of light. Max de Esteban’s four-part series, “Propositions”, explores technology and its impact on human social engagement. Across the series, de Esteban meticulously constructs photo-assemblages, utilizing the very digital tools being critiqued. The exhibition includes work from “Proposition Three: Touch Me Not”, which superimposes cell phones, gameboys and other instruments of social engagement. Also presented, is a lushly- colored, large-scale artwork from “Proposition Four: Heads Will Roll”, with which de Esteban merges and juxtaposes images, text and found objects—resulting in a cacophony of information that is at once dense with information yet visually legible. The exhibition runs concurrently with the European touring exhibition, “Bauhaus und die Fotographie” – the key exhibition presented to celebrate 100 years of the Bauhaus. Fogelson and Esteban, are two of the ten contemporary photographers curated into the exhibition, and considered to be exemplars of a new vision in contemporary art. For this exhibition, Klompching Gallery has brought together a selection of some of the same artworks.